Men! Worried that eveil feminists will destroy your life and your financial future because, apparently, they have that power and love to destroy men’s lives for fun? Fear no more, because Reddit’s Men’s Rightsers have your back! Mods of Reddit’s RedPill subreddit have started something called the Feminist Victims Fund, which will enable brave freedom fighters to send what will inevitably be a tiny amount of money to that dude who got fired after Adria Richards complained about a sexist joke he made, even though it wasn’t Richards who fired him and indeed she’s said she hopes he gets hired back! 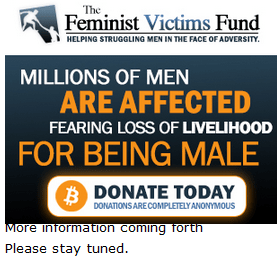 Make sure you donate now, because Reddit’s MRAs will soon grow bored with this bold initiative and it will be completely forgotten, much like the massive Sink Misandry protest in Washington DC last year which actually didn’t even happen, come to think of it. Feminism has caused some serious changes to our culture, to our society, and to our lives. We focus on some that are affected more than others, and we give back. Our goal is to encourage men to speak out, to be men, to not fear oppression and enjoy their freedom of speech. Unfortunately in today’s climate, being a man has become a financial liability. Say the wrong thing in the wrong place and you can find your entire life ruined. Destroyed. We’re saying that enough is enough. No longer should men fear masculinity. No longer should speaking up risk a man his job, career, or family. It’s time to rise up against the tyranny. It’s time to tell men it’s ok to speak up. We’re here for you. This is the Feminist Victims Fund. Did I mention that you can donate using BITCOIN? In case you were worried that this thing wasn’t Reddity enough. Cranky’s his default state, isn’t it? @Kitteh her majesty does love to pose. When I figure it out so much kitty pictures. Obnoxious amounts. Kitteh — yeah but he’s usually not this loud about it! Anyways, I’m going to toss him a sinking treat and hopefully coax him off the surface (dude, swallowing air and blowing it out your gills is like a fish burp or something, knock it off!). And then off to bed for me. Thanks Argenti Aertheri, she looks so lonely in her tank I just don’t want to traumatize her. Seriosly are we supposed to be the scary feminists? I’m feeling very non hypergamy. man that didn’t work well :/ I tried my best. Sigh. Slippery women and all that. Fish with bad burps, reminds me of the shots of marine iguanas snorting (or sneezing) salt out of their noses in Attenborough’s latest series. Cannonball, ‘fore I forget, did you read A. Lloyd Moote’s bio of Louis when you were studying him? It is a tank then? Assuming it’s big enough, and big enough here is large enough to make me jealous (like, 100g or something custom, they’re basically pretty carp) — I’d just get her a friend. Check ammonia et al first, and the tempature, they do fine at cold temps, don’t need a heater, and afaik koi and goldfish are better off without one. Ok, now I really am going to bed though, g’night! I love the way reptiles rid themselves of excess solutes. There’s something particularly beautiful about the crying sea turtle. You know, a woman needs a man, like a woman needs a fish. Isn’t that what Dworkin said? Something like that anyway. Not while I was studying him, it was a bit later when that was published but i found it a bit revisionist? Night Argenti; I think I’m going offline too so good night all. G’night Argenti, I hope it’s ok to shorten it, thanks for the advice. It’s the only full bio of him in English (I’m monolingual) so I haven’t much to compare it with. There are so many totally contradictory views of him, and this one came reasonably close to the impression I’d gained from years of reading, all of which happened long before we were in contact. I’ll probably be going to bed soon too, but it takes me for.ev.er to follow up on that promise XD which I really should do, seeing as how I need to wake up in 6 hrs. And on that note, I’d better hobble off home too. Later, folks! Cannonball, between us we could prolly bore the pants off everyone talking history, and there are some serious history buffs on this site! Niters to all them as is sleepin’! This is really really late, but I find it useful when confronted by misogyny or other ignorance to go, “Wow, you really think that?”. A lot of times, hateful people will say things like that in an attempt to get others to validate them, so if you make it clear that they’re not going to get it, they’ll probably end up feeling embarrassed. It works even better when they’re just parroting something they heard once, because then they realize they can’t actually defend what they’re saying. Your dissertation sounds fascinating, what are you studying if you don’t mind me asking? Thanks for the advice 🙂 I’ll probably try one of the things you guys have been suggesting. Hi LBT! I just left a trio of comments on the forum. Say, Cannonball, did you ever read Elizabeth Wirth Marvick’s book on Louis’s childhood? If you’ve been reading here you’ve probably seen a few of my HULK SMASH rants about how humourless Freudians should not be allowed to write about little kids making poo jokes. The sheer amount of bawwwing coming from the MRA reminds me of kindergarten.